A broad consensus on the future of Castlefield in Manchester emerged from a spirited debate last night. Broadly speaking, the panel and audience alike shared the view that Castlefield could become the antidote to the city centre’s lack of green of space, with tranquil gardens and a children’s play area making the most of its waterside setting. Daytime events such as farmers’ markets or craft fairs could help to bring people into the area. It should also link into surrounding attractions such as the Science and Industry Museum and Deansgate, and be better signposted. A lick of paint on some of the bridges and railings wouldn’t go amiss either. There was corresponding agreement that a return to the area’s 1990s heyday as the city’s drinking and party venue is now both unrealistic and undesirable. There are too many trendy new bars elsewhere in the city centre, and too many new residents in Castlefield, who, understandably, are not keen on living amongst drunkenness and excess every weekend. The debate was provoked by a typically forthright article by local journalist Phil Griffin and published on the equally provocative Manchester Confidential website. 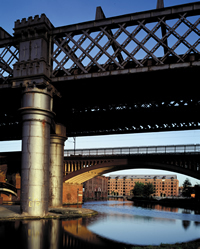 Few people argued with his opinion that Castlefield has lost its way in recent years. The practical upshot was an agreement to create a new partnership of local residents, businesses and the council to steer the area towards a brighter future. Personally, I’m all in favour. There is huge potential for Castlefield to play a really important role in the life of the city centre. And it was encouraging to see that people have a strong sense that something needs to be done quickly, along with broad agreement on what it should be. Well done to Manchester Confidential for setting the ball rolling – the task now is make sure it doesn’t lose momentum. Today is World Environment Day 2007 - what are you doing to celebrate? Sammy, our River Mersey Relayer is taking a hike, literally, walking with Environment Agency volunteers, ramblers and members of the public from Howley Weir, Warrington to Fiddlers Ferry. It's a beautiful day, so why not hit the riverbanks and see if you can spot Sammy? The walkers are setting off from the Weir Lane section of Victoria Park on Knutsford Road, Warrington at 10:30am today. Last week I shot Liverpool. Yes, it's time to come clean. Myself and 97 others are guilty - we shot Liverpool on Saturday 26th May. But we weren't out in the streets with AK47s or anything like that - no, digital cameras were the order of the day as we took part in Shoot Experience's Shoot Liverpool event, based at the Tate Liverpool. 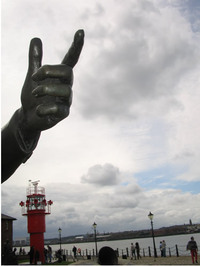 We set out in teams of 2-4 to follow ten clues on a photographic treasure hunt around the city's waterfront. All the clues were tied in to the (highly appropriate) theme of 'WATER', and each team submitted ten photos as their answers after five hours of creativity, daftness and dressing up. 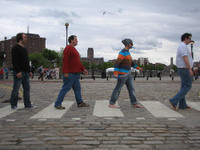 My team and I did everything from staging a tea-party on the Albert Dock, to making friends with a mannequin at the Mersey Ferries ticket office, and recreating the cover of 'Abbey Road', starring a small pirate who looked suspiciously like my boyfriend. The photos from the Liverpool event are being displayed at Liverpool's Open Eye gallery between 5th-9th June 2007. Can't wait to be an exhibited artist! There is an uncertain future regarding the level of funding of Local Biodiversity Record Centres and if you would like to support future funding of LRCs a petition to the Prime Minister has been set up on the 10 Downing Street website. 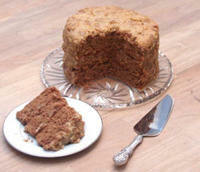 Take a look at the petition, and if you would like to show your support please sign it. Campaign staff got together with voluntary sector representatives last night at the Maritime Museum in Liverpool for the Campaign's annual Voluntary Sector Forum. The evening got off to a flying start with a cracking selection of cakes on offer to revive those flagging post-work energy levels. First on the agenda was the presentation of 2006's Unilever Dragonfly Awards. Compere Tony Durrant made a bid to be considered for host of the Baftas with his humorous and smooth handling of the festivities. Star of the show was Tom Workman, individual winner, who received a loud ovation from the room. Representatives from the Young People category winner - Canon Burrows School - took advantage of it being half-term to take a trip over to Liverpool and receive their beautiful recycled glass trophy. Overall winners, the Friends of Platt Fields Park, were represented by Victor Blunden, who masterminded their nomination. After the glamour of the presentations, everyone settled back to enjoy the keynote presentation. Richard Leafe, brand-new Regional Director of the newly-formed Natural England gave us a great insight into aims and plans of the new organisation, as well as detailing some of the ways that volunteers can get involved. He also issued a call for everyone to visit their nearest National Nature Reserve to see the 'jewels in the crown' of Natural England. You can find yours by visiting their website. There were plenty of questions from the floor for Richard, and even an invitation from one attendee for him to visit a particular trouble-spot. It looks like Richard's got his work cut out in the coming months. Look out for an in-depth interview with him by the campaign's own Matthew Sutcliffe in the forthcoming issue of Source Magazine. The next part of the programme saw Alan Jemmett from Merseyside Environmental Advisory Service give the forum an insight into the Merseyside Waste Development Plan, before everyone reconvened in the function room for networking...and perhaps just a little more cake? BTCV's Environmental Trainers Network has updated their training programme for Jan 2007 to May 2007. Thought this might be of interest...it certainly interested us up in Lancs. http://www.globallink.org.uk/climatechange There isn't much information as yet because this is a brand spanking new interactive exhibition. Global Link a development education centre in Lancaster has received funding from DEFRA's Climate Challenge Fund to build and tour a multimedia interactive exhibition, about Climate Change, around the northwest and occasionally nationally. Trucking with Climate Change is an interactive multi-media installation about climate change built into a 7 metre long trailer. It can be displayed in schools, town centres, community centres, parks, festivals or anywhere with access to a power point. The exhibition aims to increase understanding of the causes and effects of climate change, and to motivate and empower people to take action to reduce their ecological footprint. It is designed for young people and adults from the age of 10 upwards. Participants are guided through 4 small rooms inside the trailer. Room 1 explores the impact of climate change in the world NOW, particularly in Africa and Asia; Room 2 explores the science of climate change; Room 3 explores the impact of climate change on the UK in the future; and Room 4 explores what we can do individually and collectively to reduce our ecological footprint. Welcome to the new-look Mersey Basin Campaign blog. We had such a good time this summer blogging about our activities around Mersey Basin Week (click here to see the MBW06 BLOG) that we decided to get a new, more permanent blog. Think of it as an early Christmas present for everyone. And here it is. Have a look around and make yourself at home. Our other blogs, Speke and Garston Coastal Reserve and Save the Gormleys will stay where they are and carry on the good work, but this blog will cover lots more subjects, and hopefully it'll do just as well as its older brothers. If you like what you read, do leave us a comment, and if you work with us and would like to write for the blog, send an email to info@merseybasin.org.uk, and we'll see what we can do.